I won't get into detail about what the money was spent for. Some of the spending was necessary and good; much of it was wasteful Democrat pork that most Americans (including many Democrats!) would abhor – if they knew about it. They never will, because the Senate’s ridiculous Filibuster rule allowed them to smash dozens of bills into one “Omnibus” bill that even the people who voted on it don’t understand. What has America so outraged is that the top two Republicans and the top two Democrats in Congress decided ON THEIR OWN what would be in the monster spending bill that would add $1.3 TRILLION to our horrendous National Debt. They allowed no real debate on the floor. There was no time. These four waited until the last minute when America was facing a government shutdown within hours to spring this on their colleagues. The House and the Senate were only allowed 24 hours to read, study and research a 2,230-page bill. Guess how many read it? None. Rand Paul tried, but no one can comprehend 2,230 pages of lawyer-speak in 24 hours - even if they don't stop to sleep, eat, or go to the restroom. The Four Bozos knew this. But one of the Bozos was Nancy Pelosi, who famously said of the infamous ObamaCare bill (which was about the same length), "We have to pass the bill so we can see what's in it." This is not the way America is supposed to work. Even though the Four Bozos had created it and ordered their respective parties to vote for it, 24 Republicans in the Senate voted "NO!" The president threatened a veto but ultimately decided to sign the bill because the military is in desperate shape. Obama promised in his first campaign that he would cut our military in half. He almost succeeded. Again, I don't have space for details, but here's the summary: Our troops haven't had a real raise in ten years. We're down to only five battle-ready brigades. Half the Navy's planes can't be flown. And on and on and on. President Trump knew he had to reverse this suicidal trend, so he signed the bill. But he promised he would never sign such a bill again. Unbelievably, it's not the Democrats that are keeping this archaic, unconstitutional rule in place. It would allow the Republicans, who are in the majority, to pass bills on a simple majority vote - just like in the House - and almost every legislative body in the world. But the Republican Senate Majority Leader, Mitch McConnell, won't allow it. To be clear, Mitch McConnell – and only Mitch McConnell - has the power to get rid of the Filibuster. Senate Majority leaders have done so in the past with a particular class of votes. Harry Reid used “The Nuclear Option,” as it is called, to invalidate the use of the Filibuster for Senate approval of presidential appointments – except Supreme Court nominees. McConnell himself did the same when he added Supreme Court nominees to the list of “non-Filibuster” votes, allowing the confirmation of Supreme Court Justice Neil Gorsuch. What would be so bad about Democrats using a constitutional majority to get their way, just as Republicans would do if McConnell had the courage to go nuclear? If the Senate went back to the way it was in the beginning, Republicans would be able to pass bills with a simple majority. If they abused that power and didn’t properly represent the People, they would find themselves in the minority following the next election. The same would then be true for the Democrats. The difference is that we know the Democrats would abuse their power and anger the nation. In two years they would find themselves in the minority again, and millions of conservative Democrats would join the Republican Party. Sure, we would suffer some pain for a few years, but then it would be a very cold day indeed before America gave power to the Democrats again. Most people I talk to think the 60-vote rule is in the Constitution. It most definitely is not. Each House has the power to make its own rules. The House of Representatives uses a simple majority when it votes on bills. As I mentioned earlier, in almost every legislative body in the world – and all in the United States – 51% of the vote decides a measure. This is true in even Socialist and Communist bodies. So why do we continue to let the Senate make us look like fools on the world stage? We constantly hear Democrats say, “The Republicans control the White House and both Houses of Congress, yet they can’t manage to get this or that bill passed.” That is a LIE. And it’s a lie that Republicans used when Obama had majorities in both Houses. Most Americans take this at face value because they don’t bother to study politics. The fact is that as long as the Senate Filibuster rule exists, no party will ever have a vote majority in the Senate unless it has 60 members – a very unlikely situation. What does the Constitution say about voting in the Senate? Article I, Section Three states, in part, “The Vice President of the United States shall be President of the Senate, but shall have no vote, unless they be equally divided.” There’s no 60/40 in that language. The clear intent of the Founders was that if the vote was 50/50, the Vice-President would cast the deciding vote. Other than that one sentence, the Constitution is silent. It’s because of manipulation by Senators interested more in their own personal power than in the welfare of the nation that we have the ridiculous Filibuster that gridlocks our government. Because of the Filibuster, our political process has devolved to the point where Senator and Representatives are rarely needed. Four people decided on this bill which no one read, and which had little or no input from people we elected to decide these things. “But McConnell, Schumer, Ryan, and Pelosi were elected by the people.” Yes, but they were elected to be Senators and Congressmen. They were not elected to be a Communist Politburo of four. These four were elected by the members of their parties to be their leaders – not their dictators. But because of the Filibuster today they have unprecedented power that the Founding Fathers would never have imagined. “But the House Members don’t have a 60-vote rule, and they do their jobs.” True. And they have done what the Constitution empowered them to do. Every year they pass hundreds of bills – most of which the Senate never even considers because McConnell never allowed them to go to either a committee or to a floor vote. Harry Reid did the same thing when he was the Majority Leader. If the Senate operated under the same rules as the House, it wouldn’t be able to block issues the leadership disagrees with. You may well ask, how did the Four Bozos write a 2,230-page bill in such a short time. They didn’t. They took what they wanted from a raft of House bills that the Senate had previously ignored. Then they waited until a “government shutdown” was imminent, putting pressure on their members to vote on it without reading it. 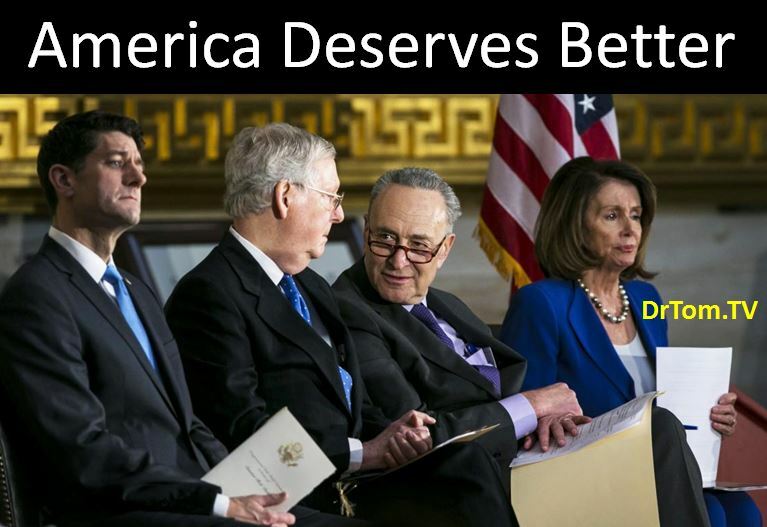 Four people should never again be allowed to put the United States in debt $1.3 TRILLION. We thought it was terrible when the National Debt rose from $19 Trillion to $20 Trillion. Now it’s at $21.3 Trillion. Four people should never again be allowed to put the President of the United States in a position in which he was forced to sign a bill he hated because it was the only way he could get the funds needed to defend our nation. We can debate about whether he should have vetoed the bill out of principle. But principle won’t rebuild a military decimated by the Democrat one-worlder who held power the last eight years. We need to Ditch Mitch (and Paul Ryan, while we're at it). Both have proven that they are not Conservatives. Chucky Schumer and Pelosi, the Democrats, bragged that they got more money for their Socialist projects than they ever got when they were in power. And McConnell and Ryan were complicit in this raid on our Treasury. Here’s why. I’m sure you’ve heard this quote from Lord Acton: “Power corrupts, and absolute power corrupts absolutely.” Nancy Pelosi, the House Minority Leader, and Chuck Schumer, the Senate Minority Leader, are both Leftist Socialists. They have always been Swamp Rats; when they were elected to their leadership positions they became even more corrupt. I didn’t follow Republican Mitch McConnell’s career closely before he became Senate Majority Leader. I do know that since he came to power, he has become just as corrupt as the others. He’s just a somewhat more conservative Swamp Rat. The real disappointment to me is Paul Ryan. As Chairman of both the House Budget Committee and the House Ways and Means Committee, he proved that he understood money and budgets, and he held the line in many cases against the Democrats and even some in his own party when they wanted to waste the People’s money. So I had high hopes when he was elected Speaker of the House in October of 2015. Something terrible happens to people when they ascend to those leadership positions. I don’t know how they do it, but the powers behind the scenes manage to corrupt them in very short order. The Paul Ryan who led the House Budget Committee would never have voted for this horrendous budget-busting bill – much less helped to craft it. But Speaker of the House Paul Ryan got down in the mud with the other Swamp Rats in the leadership, and created a $1.3 Trillion mud pie. And now America has to eat it.